There's always something exciting going on in our wildlife habitat. One morning last week Randal was doing his gym routine in the garage and a bird flew in. He thought it flew back out. Well, that evening I opened the kitchen door to the garage to get something from the shelf out there and I heard fluttering wings. 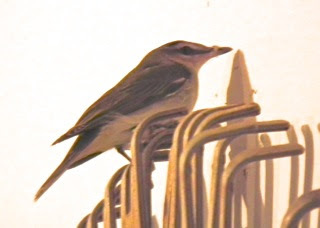 I turned on the light to find a bird perched on the rake hanging on the wall. I was concerned that it had not eaten the entire day since Randal saw it before 8 AM. I was determined not to stay awake worrying over this as I used to do. I remembered the Scripture in Psalm 56 that says God preserves animals and humans alike, so I just put my faith there and laid my head on the pillow and my brain on His lap. The next morning as dawn creeped over the horizon on the garage side of the house, I opened the door and worked at getting the bird to fly out. For some reason they seem to like to fly high for the skies (or 16' garage ceiling) so I wasn't getting anywhere. After a short time a hummingbird flew in and was now also flying high and getting exhausted as I used the rake to get her to sit on it so I could lower it down under the garage door. 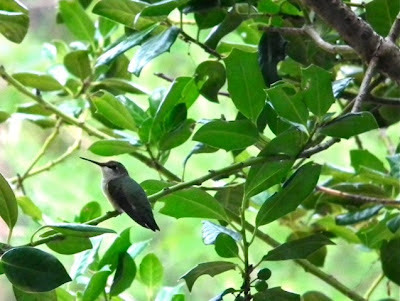 It didn't take long for the hummingbird to tire since it couldn't have gotten more than a few sips of nectar by that time, so at least that only took me about 10 minutes. Now back to the other bird which was a Red-eyed Vireo. He wanted nothing to do with the rake or getting close to me, so he kept flying all over. I was concerned he'd injure a wing or something as he hit the ceiling and glass windows. After almost an hour, he finally settled on the window sill exhausted and I was able to grab him with my hand and take him outside. He had spider webs all entangled on his feet, so I wanted to get those off before releasing him, but I only got one cleaned up before he used a burst of energy to free himself and fly to the nearby cedar tree. I knew he'd get the web off the other foot, so I was just glad that I got one clean since they were connected which made it a bit difficult for him to grab hold of anything since all of his toes were enmeshed with the webs. We love spiders so we allow them in the garage and I guess everywhere he flew he picked some up. What a treat that was AFTER it was over. I've never seen a Red-eyed Vireo and certainly have not held one. This is one of the most common birds of the Eastern forests and is heard far more than it is seen. It sings continuously from the forest canopy from dawn to dusk. The vireo's song is a series of phrases interspaced with short pauses, like the song of an American Robin broken into pieces. 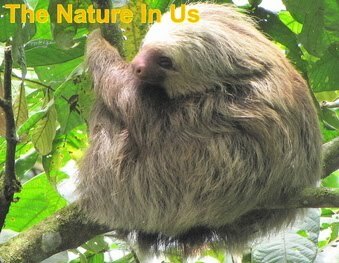 They enjoy eating insects, especially caterpillars, and small fruits. We only get them here in Virginia for the summer to breed. Sadly, this bird is a common host for the Brown-headed Cowbirds' eggs that are laid in its nest and many others by female cowbirds that will never take the responsibility of raising its own young. Does that sound like some of the current generation where more grandparents are raising children? When they hatch these big cowbirds demand a greater amount of food than the vireo's own young and sometimes the vireo's own don't get enough food. It depends on whether the habitat and the pair of parents can keep up with the demand. I love botanical gardens and there are several good ones in that area thanks to some universities. 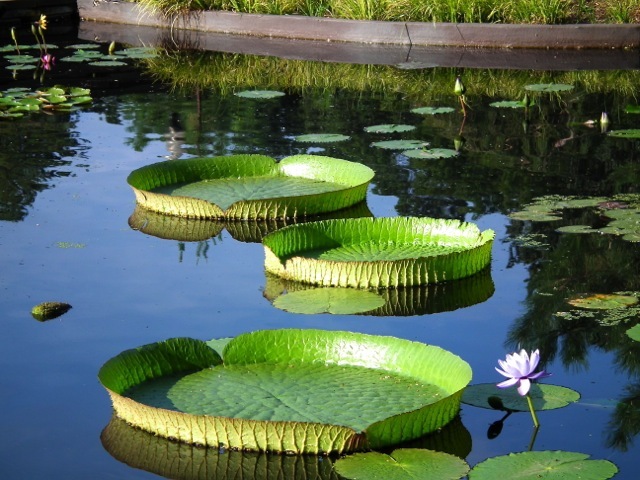 The North Carolina Botanical in Chapel Hill, NC is filled with native plants and a LEEDS Platinum building. There's tons of educational information on display in the visitor center and along the garden walkways. View the NC Botanical Gardens Photo Album. The description on the photos tells a lot more about the place. Our favorite place for this trip is the 55-acre Sarah P. Duke Gardens which are part of Duke University grounds in Durham, NC. View the Duke Gardens Photo Album. They have many ponds and fountains and we were intrigued with these huge "water lily" type plants that that looked like two foot wide platters. When we got back to the hotel we had to know what they were and discovered their name was "Water Lily Victoria." This plant has captured the imagination of the world from the very first glimpse of it in its wild South American home in l801. Named for Queen Victoria, it was nearly 50 years later that it was first brought to bloom in "captivity" in England, inspiring a wave of enthusiasm for its size and the beauty of its flowers. It is native to equatorial Brazil where it grows in calm waters along the mighty Amazon River, in ox-bow lakes (former river channels), and in flooded grasslands. Its gargantuan glossy green leaves grow to seven feet in diameter, with a pronounced maroon lip around the circumference. The lip is notched in two places to drain rainwater. Such an amazing artistic creation of our Heavenly Father, isn't it!? There's more information on it in the photo album since I took pictures of them in various ponds. This was our second visit to the Duke Gardens. Our previous one was in late November, so there was a lot more in bloom and the ponds and fountains were so much more refreshing. View the Duke Gardens Visit in Autumn Photo Album. 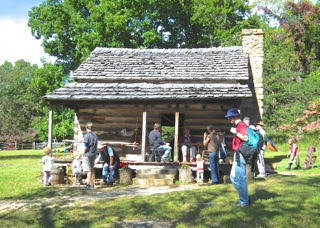 We love day trips in our beautiful state of Virginia, especially on those gorgeous September days, so we decided to attend the Humpback Rocks Homestead Farm Fest which had mountain music and all the trimmings of being on a pioneer farm in the Blue Ridge Mountains. We have visited there often since it's only about 45 minutes from us and it's on the Blue Ridge Parkway only five (5) miles in from the northern entrance point. I took a couple of short videos of the music also. The videos are in the photo album also. The album includes photos from previous visits so you can see it in all seasons except for winter. Not my idea of a good time to be in the mountains when it's cold. View the Humpback Rocks Photo Album. Even though our Virginia mornings are quite cool in the high 50's, we're enjoying the Monarch migration as the morning warms up. These butterflies travel 50 miles a day on their way to Mexico, having never been there before and flying solo. I don't know how you can believe in evolution with such amazing stories as things like the Monarch Migration. The annual migration of North America’s monarch butterfly is a unique and amazing phenomenon. 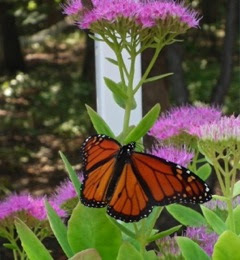 The monarch is the only butterfly known to make a two-way migration as birds do. Unlike other butterflies that can overwinter as larvae, pupae, or even as adults in some species, monarchs cannot survive the cold winters of northern climates. Using environmental cues, the monarchs know when it is time to travel south for the winter. Monarchs use a combination of air currents and thermals to travel long distances. Some fly as far as 3,000 miles to reach their winter home! 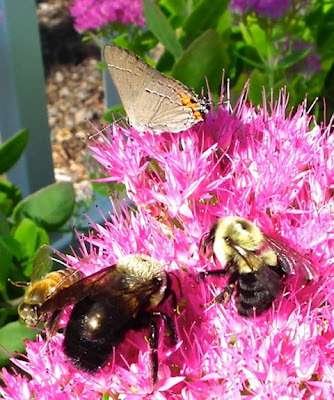 They have been all over the sedum blooms as are the bees. As the sun goes down and the temperatures drop, the bees just stop working and position themselves for a nighttime rest. I love it. It's so cool early in the morning to find them hanging here and there around the garden. I think bees are so very cool and I love to give them a back rubbie while they're feeding. They don't mind at all. Sometimes in the mornings I will scoop one up from where it went to sleep to place it in an area of the garden that is sunny so they can warm up and get to being "busy as a bee." They just need that sunlight to get them going ... kinda like we need the Son Light to keep going in our own lives also. There's a lot of research that's been done on bees. Of course there's been a lot of news about their decline and the price of honey has sure skyrocketed. I've used honey as a sweetener for baking, etc. since the late 70's so it amazes me how much it is now, but certainly full of nutrition and wonderful properties. However, the main concern with the bee decline is that if we don't have bees, we don't have food. A Cornell University study found that in the U.S., bees annually pollinate more than $14 billion worth of seeds and crops—mostly fruit, vegetables and nuts. Another study shows that bees are intelligent planners. Don't swat at them or they'll be afraid of you and go into defense mode. Bees can remember faces. Ever notice that those who are afraid of bees are always the ones that get stung. Even if they don't recognize their fear (maybe something implanted as a child) the bees sense it and react. I usually give you an update to my health in each issue, but this time I did a separate blog post on it. I appreciate all who have emailed me to tell me you are rejoicing with me on this healing journey. I do pray it encourages many (all) of you to consider and believe that God has already healed each one of us. If we have the mental attitude that we are waiting for God to heal us, we won't get very far. Living 25 years with rheumatoid arthritis and it now being gone for almost five (5) months sounds like a great miracle to me, but that's not the foundation of it. For a deeper explanation of this, read "Dealing With Long-term Diseases." 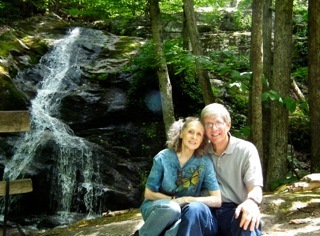 Rejoicing in what God has done in healing Donna.